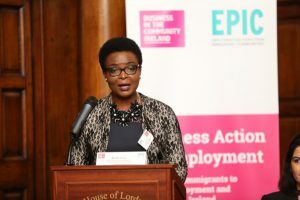 Ebere is originally from Nigeria and a naturalised Irish Citizen. Before moving to Ireland she worked as a Clerical Officer with the government and got a Higher National Diploma in Banking/Finance. She arrived in Ireland along with her children in 2003. From the beginning, Ebere had a strong focus on getting prepared for employment and decided to study to further her knowledge and skills. She completed FETAC level 5 in Office Skills, ECDL training, and a Higher Diploma in International Business and Sales. She was also very eager to learn more about the country, the culture and to become part of the community. Simultaneously, Ebere applied jobs and also did work experience. She worked as a sales advisor for a period of time but somehow, didn’t succeed on her applications to gain employment in administration, her area of interest and passion. Her neighbour recommended the EPIC Programme and as soon as she enrolled in the services she felt encouraged and very motivated. The training helped her to get energised and positive while she learned more about how to apply for the jobs she wanted. Attending the IT training with BT made her understand how important was to refresh her knowledge. Different recruitment agencies asked her to complete tests in the use of Microsoft Office as part of the selection process for the roles she applied for. Ebere’s score was always 85% and up and such results gave her great confidence. The mock interview with CPL helped her to understand the areas where she needed to improve and also to identify her own strengths. Taking part in the workshop with Enterprise-Rent-A-Car provided her with practice on difficult interview questions giving her more confidence and also the opportunity to learn from other classmates. Ebere also received individual support in all the steps needed to apply for employment. She is now working with the Government as a Clerical Officer.